Detailed solar electrical design sustains long term performance. We are determined to efficiently move your commercial or utility-scale project from initial construction to energy production. When designing large-scale ground mounted solar energy facilities, we leverage our full range of civil engineering services to ensure that every goal is met along the way. Blue Oak Energy’s civil team is solar-specific, known for the most streamlined and efficient grading and drainage designs. Our cohesive multi-disciplinary engineering services focused specifically on photovoltaic systems means we have the expertise to efficiently design PV systems and the associated site mitigations. This translates into a cost effective hydrology and water retention approach, and a balanced earthwork design. We carefully balance the expectations in quality and cost while also ensuring that the final product satisfies the highest standards of professional compliance and integration with geological, community, and environmental features. 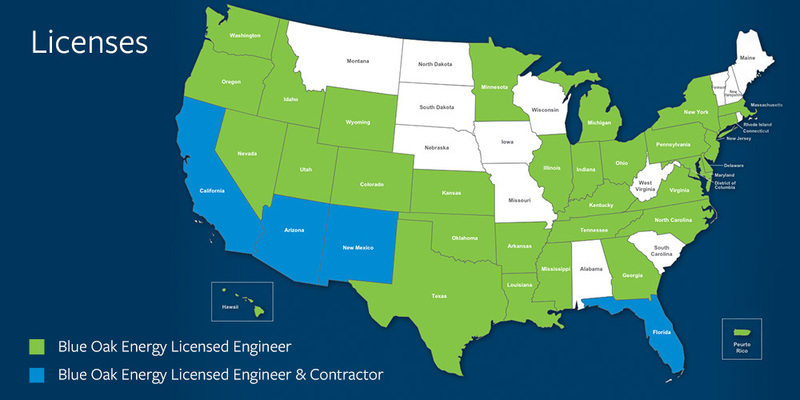 Read on for an in-depth look at our scope of civil engineering services and best practices. Commercial and utility scale solar projects bring immense possibilities for clean energy production and cost savings. But full savings won’t happen unless you plan ahead and obtain adequate solar engineering, permitting, and interconnection approvals with the local electric utility and the grid balancing authority. At Blue Oak Energy we apply our advanced electrical engineering expertise to ensure your project obtains proactive and timely permitting and interconnection approvals. We are determined to efficiently move your commercial or utility scale project from initial construction to energy production. Plugging into the power grid is a detailed step-by-step process requiring knowledge about regulatory compliance requirements, efficient product applications, and latest technological advances. Blue Oak Energy has the modern experience, knowledge, and expertise to get your project connected and built within the confines of limited budgets and schedules. Read on for a more detailed look at how our solar electrical engineering services fit into the larger process. "Before partnering with Blue Oak Energy we literally worked with over a dozen engineering firms trying to find a team that shares our passion for implementing high quality, long lasting solar systems." When it comes to planning a site for a solar utility project, Blue Oak Energy does not believe in cutting corners. We understand that the money invested in the initial stages can go a long way towards a facility’s successful operation during its 30-year lifespan. The initial planning process requires a great deal of negotiation with local jurisdictions, utility companies, and governing agencies. Our team works through the terms of Conditional Use Permits (CUPs), Power Purchase Agreements (PPAs), and Interconnection Agreements (IAs) while also discussing and making determinations on such issues as: topography and boundary surveys, grading, stormwater mitigation, retention features, fire suppression planning, options for mounting systems, and the need for an Operations and Maintenance building. We try to bring as much flexibility as we can to the negotiation process to guard against unforeseen changes in property, interconnection, and technology that might occur down the road. As part of the planning process, Blue Oak Energy will conduct a hydrology study with stormwater and flood calculations, and provide a review of the owner-supplied project studies, requesting additional data as necessary. We will assess the status of the topographic, boundary, and geotechnical data and determine what is sufficient for design and what still needs to be conducted for project success. Blue Oak Energy can assist in managing any sub consultants necessary for project completion, as well as pick up where developers left off in terms of preliminary engineering and project study creation. Any way the client would like to handle it, Blue Oak Energy will accommodate and assist along the way. Our civil design provides the underlying structure of systems within which solar power facilities can exist and operate. Incorporating grading and storm water mitigation constraints early on with the PV array layout team allows us to optimize motor blocks and integrate the design as a whole. We have a track record of balancing any earthwork quantities on-site, efficiently designing the on-site access roads and assisting with the design choices that help minimize construction costs. 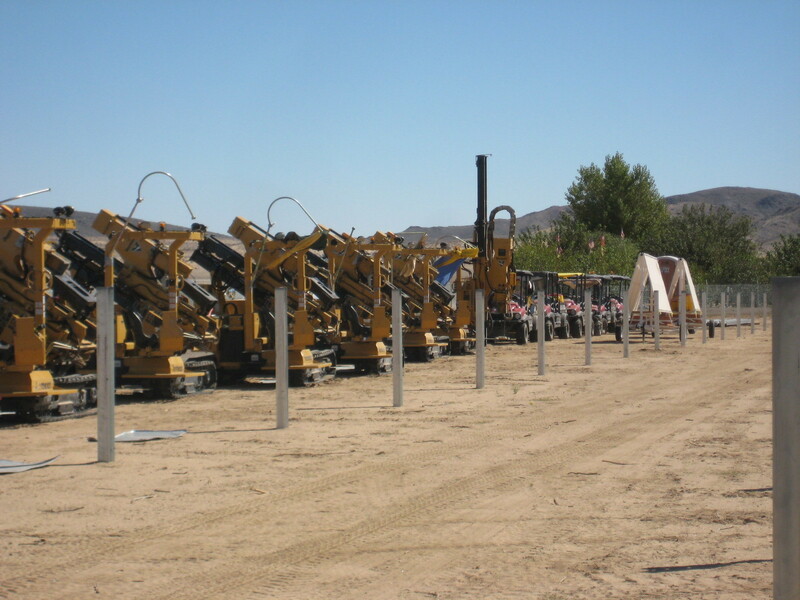 We have extensive experience with solar racking and tracking products and we foster continual product vendor dialogue to engineer a clean, sensible, and cost effective solar facility. We will always balance and minimize the amount of land disturbance to solar farms, because each and every environment has unique sensitivities. Final construction drawings and documentation will detail the entire civil infrastructure, including the design of project and access roads, the laydown area for the PV array, design and layout of any permanent fencing and PV racking systems, site grading, existing easements, and locations of inverter skid foundations. Once agreements and permits are in place, Blue Oak Energy provides a csv.file of locations where civil elements will take place, and an extensive civil design package that will address civil engineering aspects of the project. We utilize Civil 3D software which incorporates the racking foundations, the proposed ground surface and a top-of-pole elevation to ensure constructability is fully achieved. During the civil design stages leading into construction, we will comply with the regional water and air quality control board standards. Erosion and sedimentation control plans will be carefully crafted to meet the guidelines by the governing agencies. Blue Oak Energy considers the SWPPP a necessary and sound environmental practice. SWPPPs are required for developments that disturb an acre or more of soil, which means that any solar project expected to generate 200 kilowatts or more will require one of these plans. The SWPPP is a comprehensive document, containing Best Management Practices (BMPs) for protecting the site from erosion and sedimentation. Use of silt fences, gravel entrances, and wash-out pits are some of the measures typically taken to protect adjacent sites from polluted stormwater and sediment transport. The EPA and local quality control boards are the governing bodies for the SWPPP process and we ensure thoughtful compliance across the United States. Blue Oak Energy focuses on the PV system’s structural design in conjunction with the civil site development design. We ensure these portions of the project are cohesive and well balanced in order to ensure efficiency when it comes to pile design vs. grading design. 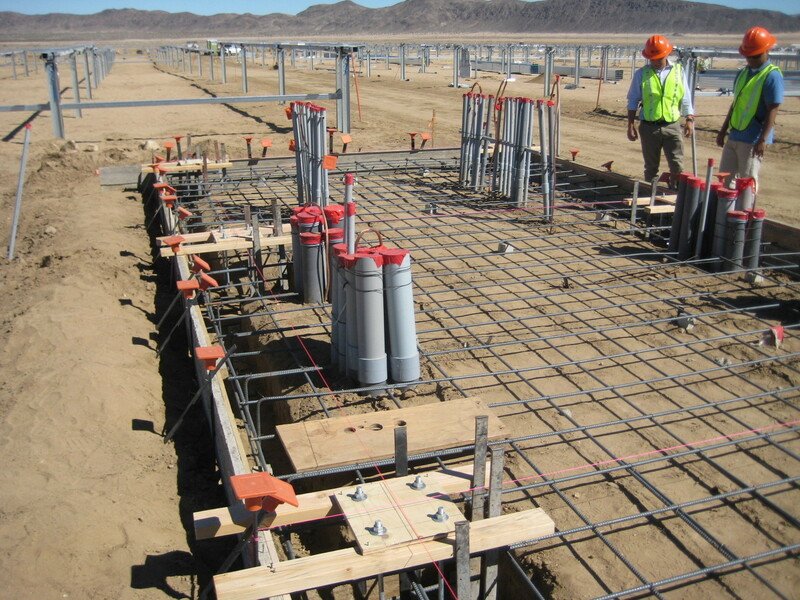 Our engineering team will design the structural pile foundations, inverter pads, and transformer pads, based on geotechnical parameters, the solar panel manufacturer’s specified design requirements, and all governing codes. Blue Oak Energy structural engineers are experts when dealing with custom structural engineering concerns. Whether designing a foundation with difficult or corrosive soils, designs subject to FEMA flood zones and sitting water, or rooftops with limited live loading availability, Blue Oak has structural engineering covered for your solar project. "Blue Oak has a well-earned reputation for technical thoroughness and practical problem solving that shows in their execution of solar installations across industry segments and regardless of scale." - Glenn Harris, CEO, SunCentric Inc. Roof survey: As part of the initial preparation for roof-top projects Blue Oak Energy will perform a detailed roof survey as the basis for an as-built roof plan. Our team will locate the exact coordinates of all rooftop obstructions, and identify surrounding objects—such as trees and power lines—that could potentially shade the solar array and impact annual energy production. The process concludes with a complete CAD as-built site plan for the design engineering team. Electrical site survey: To lay the groundwork for interconnection, Blue Oak Energy will have an arc-flash certified electrician survey the site’s existing electrical system. This includes a switchgear inspection for load-side or line-side taps and documentation of existing switchgear specifications, such as model numbers, BIL ratings and breaker sizes. The electrician will also survey the area for equipment pad locations, wall-mounted equipment locations, and conduit penetrations. Solar Energy Performance Modeling: To further model the solar project’s viability, Blue Oak Energy will conduct a weather study to determine available sunlight irradiance for the specific location. The resulting information, along with the system design, will factor into the PVSYST energy production model, allowing us to determine appropriate model inputs. Blue Oak Energy continues the utility interconnection process with a series of comprehensive agreements with electrical utilities and power system regulators such as CAISO (California Independent System Operator) and various RTOs (Regional Transmission Operators). 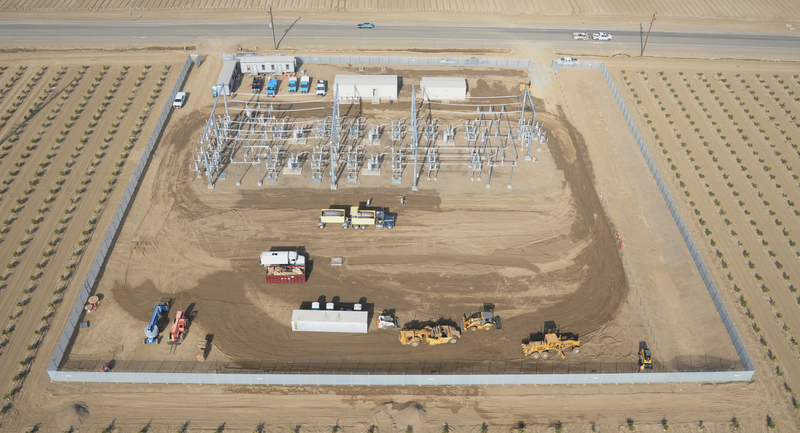 Blue Oak Energy has had great success in connecting projects to major utility grids such as those operated by PG&E, SCE, LIPA, NV Energy, APS, National Grid and many others. Fortunately, use of new technology, such as sophisticated programmable reclosers, curtailment systems, and modern utility scale inverters with power factor controls, has made the solar utility interconnection process more advanced, functional, and satisfactory for all parties involved. BOD Document: Blue Oak Energy will provide a Basis of Design (BOD) template for client review and input. Once approved, the BOD will serve as the defining document for the project going forward, determining the design parameters and standards of all work listed in the Engineering Work Order. SLD with Interconnection Design: Once we have collected the necessary data, Blue Oak Energy will generate a single line diagram (SLD) that shows the interconnection design. The SLD will clearly illustrate the AC and DC electrical systems, inverters, power/auxiliary transformers, metering, breakers, and disconnects. It will define the overall power collection strategies and outline the plant utility protection scheme. Array Layout: The final array layout is a culmination of a number of aspects, including topographic and site boundary surveys, and factors laid out in the BOD such as shade analysis, module string size, string-rack configuration, and other efficiency measures which reduce unnecessary costs. At this point we begin populating the solar array with the module layout, honing in on sub-arrays and inverter groups, optimizing inverter loading ratios, establishing preliminary road locations, and other related details. Solar utility projects are typically a combination of both low voltage DC and medium voltage AC electrical systems. Bridging the design details from DC to AC and creating cohesion throughout the design is one of the unique features of Blue Oak Energy’s design team. There is an exciting trend towards offering solar array wiring of up to 1500 Volts DC on ground-based systems and 1000 Volts DC on rooftop solar systems. We’re enthused to be at the forefront of this transition as solar facilities become more ubiquitous. Our DC electrical design incorporates solar source circuit and homerun feeder circuit wiring plans, plus the equipment pad layouts with a detailed wire and conduit entry plan. The process also involves developing a conduit routing or trenching plan, creating a more detailed single line diagram, and the final engineering for the interconnection into existing switchgear. We conclude with the final preparation of conductor and conduit sizing schedules, equipment elevations, and our highly detailed electrical and mechanical construction details. AC electrical design calls for different measures and specifications. 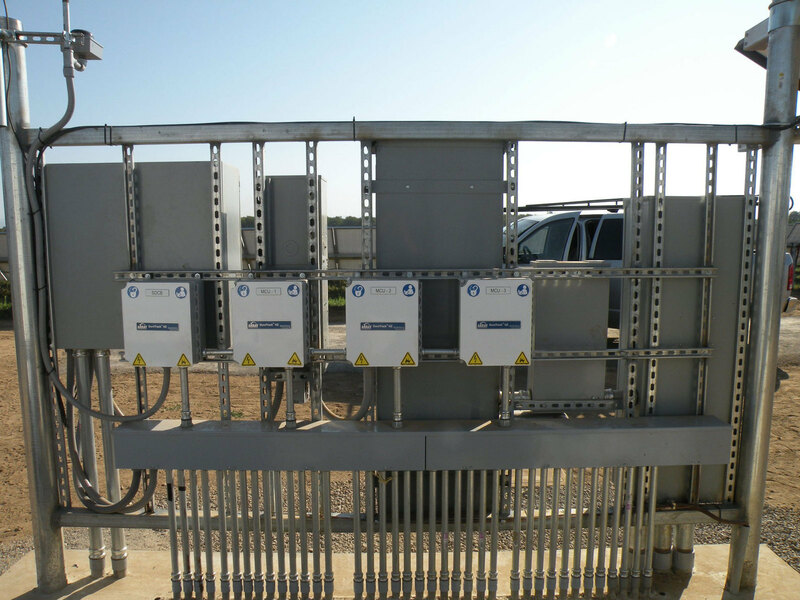 Blue Oak engineers will design and configure the solar AC medium voltage switchgear and collector system, as well as the ratings for distribution in step-up transformers. The process also requires designing underground and overhead feeders, medium voltage trenching and boring, switchgears (including breakers), and equipment elevations. During the medium-voltage process, engineers will coordinate with utility engineers, sub-station engineers, and other project stakeholders. 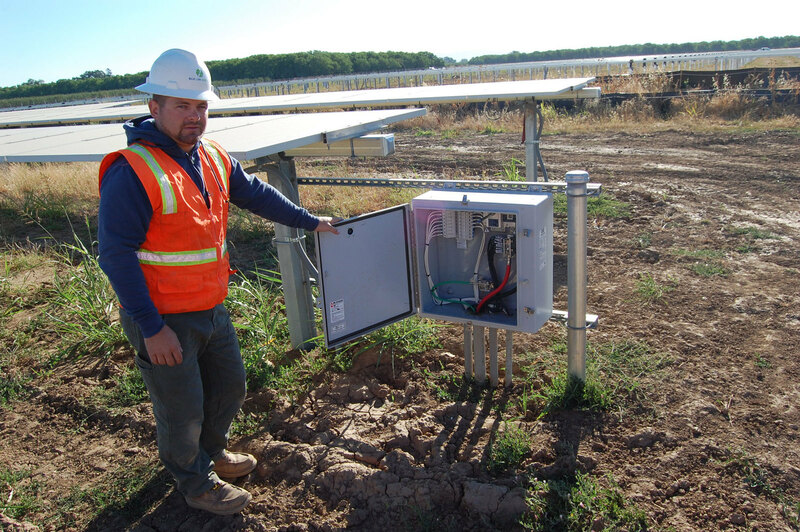 As part of its best practices, Blue Oak Energy takes the extra step of determining optimized underground cable sizing when implementing its solar PV projects. Proper sizing of underground cable requires assessing the cable and conduit spacing based on soil conditions, including during worst-case scenarios such as a flood or a drought. Blue Oak engineers use modern software packages to determine the ideal underground conductor sizes based on current flow, soil temperature ranges, soil thermal resistivity, and other factors. We are a high integrity, well-balanced team offering technical engineering services when required and experienced advice at other times.